To enter, simply fill in the Giveaway Tools form below. This giveaway will end on 5/9/16. Open to the US only. The winner will be notified via email and will have 48 hours to reply. 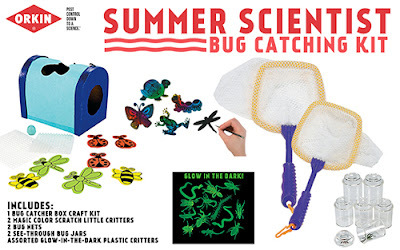 Thanks again to the sponsor for offering this fantastic prize.Each household is only eligible to win Summer Scientist Bug Catching Kit via blog reviews and giveaways. Only one entrant per mailing address per giveaway. If you have won the same prize on another blog, you will not be eligible to win it again. Winner is subject to eligibility verification. That mosquitoes are NOT attracted to bold colored clothes - like yellow!! I always thought that they were. Thanks for the info!! Mosquitoes prefer to bite adults over children. One surprising fact I learned is that mosquitos can breed in as little water as just 1 inch! I learned that mosquitoes are most attracted to adults. I learned that mosquitos can breed even in 1 inch of standing water. I learned who does and doesn't attract mosquitoes. I didn't realize they were attracted to perfumes.